I received a Target gift card to purchase LISTERINE Brand products from Johnson & Johnson Healthcare Products Division of McNEIL-PPC, Inc. and The Motherhood as part of my participation in the LISTERINE 21-Day Challenge. All thoughts and opinions expressed in this post are my own. A bright and shiny smile... it's something I imagine everyone desires. I know that it can be quite a challenge for some people to obtain that gorgeous white grin. I've been blessed with fairly nice teeth; I guess I would say I am lucky. However, I enjoy tea, coffee, and chocolate- all things that aren't so great for teeth. Did you know that brushing misses 75% of your mouth? Sure, you try to get all of your teeth, but there are some areas the brush can't reach- an then there's the roof of your mouth, your tongue, your gums, the back of your mouth.... all places that germs can hide out. I currently brush my teeth once a day, sometimes twice. I brush every night before bed, and sometimes in the morning. Mornings are crazy, so I'm often eating as I walk out the door in the morning so I don't get a chance to brush like I should. I know, I know....I SHOULD make it more of a priority, but it just hasn't been. Well, I am embarking on a 21 day challenge. The LISTERINE 21-Day Challenge to be more specific. I will make time every day to swish with LISTERINE Antiseptic and use some other great products that will benefit my oral health. I am hoping this will help my hard to reach areas (such as the back of my front teeth), and hopefully help my smile shine brighter! To start this challenge, I headed to Target to get shopping. 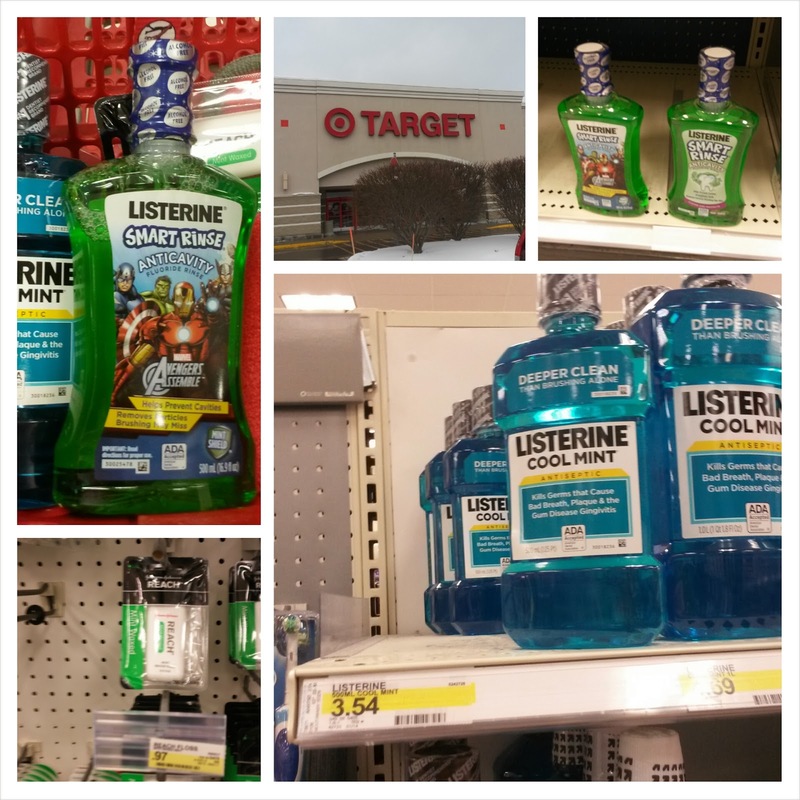 I needed to pick up the essensial LISTERINE products for this challenge. I picked up LISTERINE SMART RINSE, LISTERINE Antiseptic, and REACH Floss. I also needed to pick up some LISTERINE WHITENING Original Gel Fluoride Anticavity Toothpaste, but my local Target did not have it on the shelves the day I went. I plan on eating my breakfast first thing when I get up (even before my shower) and make time to rinse and brush each morning. We'll see how it goes. I know night time will be a breeze, LISTERINE has been part of my night time routine for several years, but I look forward to trying the LISTERINE Smart Rinse and LISTERINE Whitening toothpaste! While I am doing this challenge, people everywhere can help children in need. How, you ask? Well, by submitting a "Swish Selfie" to the LISTERINE Brand Facebook page. LISTERINE Brand will then make a $5.00 contribution to Oral Health America's Smiles Across America program, up to $85,000, toward their goal of connecting 210,000 children with needed oral health services in 2014. So, how about it, do you have your "Swish Selfie" ready to go?